Solobill was the guardian for today’s afternoon session. He provided me with the following chat log, and with his own comments interspersed. So in the rest of his entry, Solobill is the `I’ voice. I arrived at 12:55 and Dakini was already inside the tea house. Dakini Rhode: r u in charge of logging? Solobill Laville: Do you mean tracking the chat? Solobill Laville: I meant to turn my typing back on…. Solobill Laville: deep in the VOID! Dakini Rhode: ever go to a place where there are lots of avatars camping? Dakini Rhode: and nobody’s home? Solobill Laville: Good to see you! Solobill Laville: Oh, she’s back! Solobill Laville: I’ve missed a lot over the last few days! Solobill Laville: lol - I noticed! Solobill Laville: Do you see even more? Storm described his SLandscape architecture efforts. Storm Nordwind: So I have been “reverting” little square all over the place to find the natural level. Solobill Laville: Where are you doing that? Solobill Laville: Is there only a +/- 4 meter limit? Solobill Laville: OK. On islands I’ve seen big chasms. Solobill Laville: Is this near the void I read about? Solobill Laville: I read! I want to take one!!! Storm Nordwind: After this session perhaps? Solobill Laville: How long are they? I tried to pick Storm’s brain and get caught up on PaB and the additional sessions. Solobill Laville: How are things going here? Storm Nordwind: Now I write one copiously! Storm Nordwind: How do you mean? A large white and green beetle was noticed wandering around the tea house. Solobill Laville: Is there a way to communicate what we’re doing yet? Solobill Laville: I’ll check it out…I may be able to help. Solobill Laville: Oh, even better! I finally notice the beetle and Dakini “returns”. Solobill Laville: Oh, there’s your bug! Dakini Rhode: does it seem PaB is buddhist? 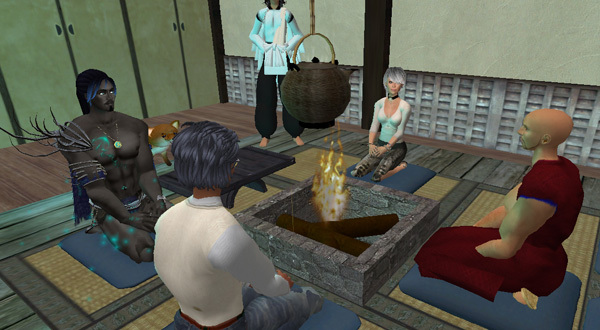 Dakini Rhode: this place SL, or the teahouse, the zen retreat, or playasbeing here? Solobill Laville: Yes, Storm, that is the real cool thing! Dakini Rhode: which changes every time? Storm Nordwind: or the perception of RL and SL as being the same? Solobill Laville: The latter is what I was referring to. Dakini and Storm discussed land matters and life matters. Storm Nordwind: you mean the terraces? Storm Nordwind: You want the reason? Storm Nordwind: This is merely symptomatic! We broached to the subject of compassion as a new guest, Trevor, arrived. Solobill Laville: A light for us moths!!! Solobill Laville: Inspiration is the great elixir. Solobill Laville: That’s pretty good Dakini. Solobill Laville: Go on, Trevor. Solobill Laville: We were just discussing compassion. Solobill Laville: That seems quite on topic. Another guest, Prosper, joined in. Prosper struggled a bit maneuvering in the tea house. Prosper Telling: mind if I join you? Solobill Laville: SL - easy to fly, hard to walk and sit! Dakini Rhode: and got stuck up there! Trevor Berensohn: Can I ask what definition of compassion? Solobill Laville: Storm? want to answer that one? Prosper Telling: Sorry,,, have a lag. Solobill Laville: I think that is what Trevor was talking about too. Dakini Rhode: a wish, and also is it a feeling? Solobill Laville: I think so, loving-kindness. Dakini Rhode: a heart connection with all beings? Storm described his view of compassion. Solobill Laville: Arhats were hollow shells? Trevor Berensohn: I’m curious Storm. What path… no follow? Solobill Laville: Not Boddhisattvas you mean? Trevor Berensohn: oh the difference between Bodhisattva and Arhat? Prosper Telling: The basic difference between Theravada and Mahayana then? Solobill Laville: Yes, Prosper, I think you are pretty much correct. Storm Nordwind sees his spelling is not quite correct! Prosper Telling: So isn’t there a point where liberation of other is liberation of self and vice versa. Dakini Rhode: we are fooling ourselves? Dakini Rhode: I want that avatar! Solobill Laville: Follow the light…. Trevor Berensohn: I’m sorry I’m new again. what’s an avatar exactly? Solobill Laville: We know what to get you for your SL birthday! Storm Nordwind: And not he cuddly bug to your right? Poor thing! Solobill Laville: Maybe the bug will go to the light! Storm Nordwind: The bug is after more basic things! Trevor Berensohn: Is a preference an attachment? Trevor Berensohn: So why did we originally do this? Dakini Rhode: we are separate? Dakini Rhode: we had to preserve our separate selves? Dakini Rhode: and everything went downhill from there? Solobill Laville: We are a bit hard-wired that way, I’m afraid. Eru changed his appearance into a more human-like form. Solobill Laville: Well Eru has made quite a transformation! Eru Males: I am Eru. Solobill Laville: Have a seat. Eru Males: It is alright. Eru Males: You may call me Eru now. Solobill Laville: This is a great community to share these ideas. Eru has summoned a red fox and is hopping it around the tea house, through all of us, and into the fire. Solobill Laville: Storm, don’t look now but there a fox in the fire! Eru Males: Do not be concerned. Kitsune: I am a spirit. Solobill Laville: I think I like Eru! Eru Males: Eru is an attendant to Inari. Solobill Laville: Dakini, is there a sitting tonight? Solobill Laville: I’ve been out of town, and am glad to be back. Eru Males: He likes you. Solobill Laville: Prosper, is this your first time here? Solobill Laville: Yes, this whole are is wonderful. Storm’s gardens are awesome. Solobill Laville: Storm, did you share the PaB url with Prosper? Dakini Rhode: is Inari the Japanese fox god? Eru Males: Yes, we know. Trevor Berensohn: What about a Greek temple? Trevor Berensohn: I think I’ve seen it then? Trevor Berensohn: what time is it there now? Solobill Laville: That is the time on the top right of your SL window. Solobill Laville: And PST, yes. Solobill Laville: if I conclude the 1:00 session? Dakini Rhode: sure it is, you’re the guardian! Solobill Laville: I need to run. Dakini Rhode: r u ok with saving the chat? Solobill Laville: Yes - I will compile it. Solobill Laville: You too, Trevor! Storm Nordwind: A very long one this time! Solobill Laville: Yes, until we meet again, peace! Dakini Rhode: is this OK with you Trevor? Storm Nordwind: Are the newcomers ok with that? Solobill Laville: Not permanently anyway! Solobill Laville: bye for now.